The 23rd International Humanitarian and Security Conference, presented by Webster University Geneva will take place on February 15-16, 2018, at the International Conference Center Geneva with the theme of The Need For Effective Global Compacts On Refugees And Migration. The conference opens with remarks by Michael Møller, Director-General of the United Nations Office in Geneva (UNOG), Olivier Coutau, Délégué à la Genève Internationale and Maurizio E. Serra, Permanent Representative of Italy to the UNOG and Other International Organizations in Geneva. 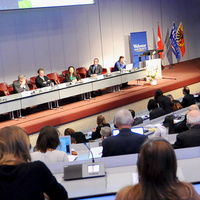 Keynotes include speeches by Pierre Krähenbühl, Commissioner-General of the United Nations Relief and Works Agency for Palestine Refugees in the Near East (UNRWA), Antje Leendertse, Permanent Representative of the Federal Republic of Germany to the UN Office in Geneva and Other International Organizations, Idriss Jazairy, Executive-Director of the Geneva Centre for Human Rights Advancement and Global Dialogue, Matteo Pedrazzini, President of the Croix-Rouge genevoise, and Monica Dialuce, National Inspector of the Italian Red Cross Volunteer Nurses Corps. Education of children in emergency situations. The conference will be organized with the participation of the United Nations High Commissioner for Refugees, the International Committee of the Red Cross as well as other governmental and non-governmental organizations. As in previous years, it will be held under the auspices of the Conseil d’Etat (Government) of the Canton of Geneva.